How Does a Gas Water Heater Thermocouple Work? If you have a gas water heater or gas furnace, you have to be prepared for a thermocouple malfunction because thermocouples wear out. "But wait," you say, "what's a thermocouple?" It's a tiny thermoelectric probe that signals the gas valve to stay open whenever the pilot is lit. If the water heater or furnace thermocouple fails, you'll still be able to light the pilot, but it won't stay lit, and your gas appliance won't work. You can't repair a worn out thermocouple, but you can replace one, and the procedure is actually fairly easy. As is true with any gas repair, it's important to work safely, and that means shutting off the gas before you replace a thermocouple. Locate the pilot light on your water heater or furnace and you've found the thermocouple. It consists of two parts. The first is a small probe, about an inch long and 1/4 inch in diameter, positioned just above the pilot orifice in such a way that, when the pilot is on, the tip of the probe gets heated by the pilot flame. The other part of a thermocouple is a copper tube that connects to the front or side of the gas valve by means of a small nut. You can remove the thermocouple by unscrewing this nut and unclipping the probe from the bracket that holds it close to the pilot flame. How Does a Water Heater Thermocouple Work? Inside the probe are two different metal plates separated by a small gap at one end and joined together near the base of the probe where it connects with the metal tube. When these two metals get hot, they generate a 25- to 35-millivolt electric current that travels along the tube to the gas valve. The current actuates a spring mechanism on the gas valve that keeps the valve open. if the current is too weak, the spring closes the valve and the pilot goes out. The thermoelectric effect that makes a thermocouple work is called the Seebeck effect, named after the German physicist who discovered it in 1821. The Seebeck effect works with any two dissimilar metals, but the ones most often used in gas water heater thermocouples are stainless steel and copel, which is an alloy of nickel and copper. A water heater or furnace thermocouple may be bad if you can light the pilot but it won't stay lit when you release the control knob after lighting it. A faulty thermocouple isn't the only thing that causes this, however. The pilot flame may be too weak to heat it to the proper temperature, and that could be because the pilot tube is blocked. You can't assume that a faulty thermocouple is causing your pilot problems, so it's best to test it before you replace it. You can do a basic test with a multimeter set to measure millivolts. Connect one multimeter lead to the copper tube with an alligator clip and touch the other lead to the nut that connects to the gas valve. The nut must be disconnected from the valve when performing this test. Start the pilot, hold in the gas control to keep the flame lit and check the meter. Assuming the pilot flame is at least an inch in height and burning blue, any reading less than 20 mV means the thermocouple needs to be replaced. If the water heater pilot won't light at all, or the flame is weak, make sure the gas is on, clear out the pilot tube with compressed air and perform the test again. 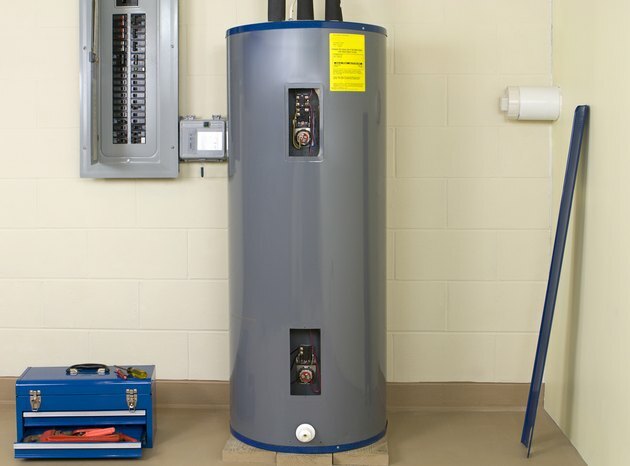 How Do Gas Water Heaters Work?